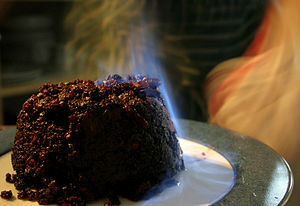 Considering I don’t actually like Christmas pudding, it may seem a little strange that this is actually the fourth post I’ve written concerning the stuff in as many years (you can find the previous three here, here and here) – but I keep finding interesting and unusual historical recipes for this most seasonal of desserts! And this recipe is a particularly interesting one, which dates from sometime during the interwar period. I’ve written previously about strange and interesting seasonal traditions, but here’s one I don’t think I’ve ever covered before…. A Twitter discussion last week about the wonder of proper British puddings (seriously, they really are the best in the world when done right) reminded me that today is Stir-Up Sunday. In this age of ready meals and 24 hour supermarkets, that may not mean much to you, but for many families it has long been the traditional start of the preparations for the Christmas season. That’s all very well, but what exactly does Stir-Up Sunday involve in reality? It’s the day on which households would traditionally gather to make the Christmas pudding for the year, having been reminded by the prayer said in church that morning – with each member of the family taking it in turns to ‘stir up’ the mixture and make a private, secret wish. In some traditions, there is a distinctly religious element to this, as it is believed that the pudding mixture must be made with twelve or thirteen ingredients (to represent Jesus and his disciples) and stirred from East to West (right to left, or clockwise) to honour the Three Wise Men of the Nativity. It can’t have failed to escape your notice in recent months that most of the major supermarkets have been pulling beef products off the shelves at a rapid rate of knots due to the fact that it has been discovered that they have been adulterated with horsemeat. Unlike many other cases of food adulteration, this isn’t necessarily a public health issue. In Britain, at least, the decision not to consume horsemeat is a cultural choice (although this hasn’t always been the case); however, this is more a case of whether we can assume honesty and are able to trust the products that we buy – or not. If our microwave meal claims to contain beef, for example, then beef is exactly what it should contain. What is in our food is actually regulated by law, but that hasn’t always been the case either – and the horsemeat scandal shows how ineffective even these modern laws can be against those determined to make a fat profit out of the food we eat, whatever the consequences. However, a horsemeat lasagne is really nothing compared to some of the highly disturbing things that have been found in foodstuffs in the past. I’d agree. Life is uncertain. Which is why I approve of any excuse to eat more ice cream. Or cupcakes. Or tiramisu. Or sticky toffee pudding. Or gateau. Or cheesecake. Or anything chocolatey. Or…. I could be here all day at this rate! 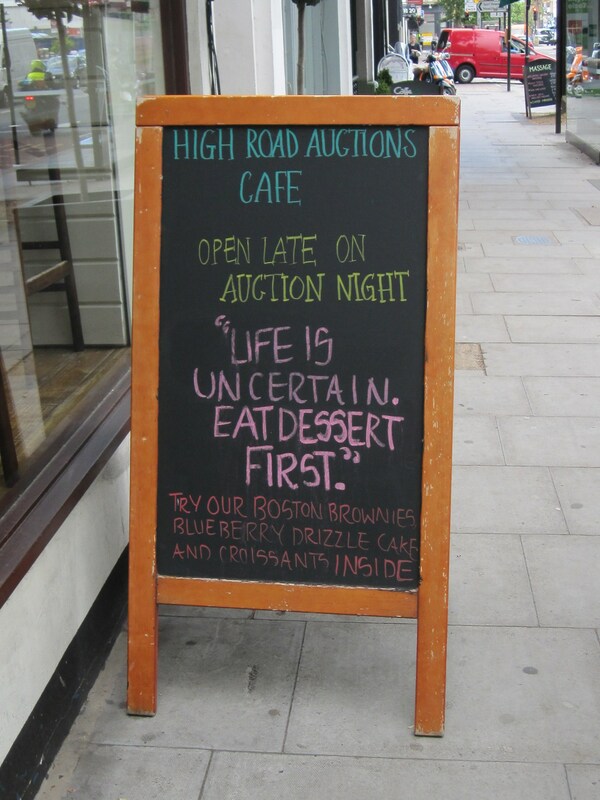 Spotted outside a cafe on Chiswick High Road in West London last week. We drink it every Christmas (in fact, I’ve already been glugging away at it over this last weekend! ), and many of us see it as an integral part of a ‘traditional’ festive celebration. These days, you can even buy it ready-made in most supermarkets – although it really does taste much nicer if you make it from scratch (see below for some easy recipes to try). We all know that it’s a spicy and warming seasonal tipple, but what exactly is mulled wine? Where does it come from? How ‘traditional’ is it? Has the recipe changed over time? And, more precisely, what on earth is ‘mulling’ when it’s at home anyway? Put very simply, to ‘mull’ wine means to heat and spice it, often adding fruit to the mixture too. This process infuses the wine with the spice (and fruit) flavours, giving it that familiar warming kick. 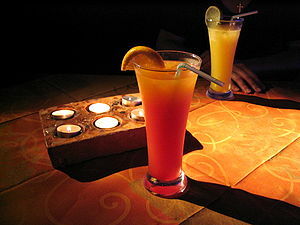 Other alcoholic drinks can also be mulled, including cider, mead, ale and brandy, as well as fruit juices. 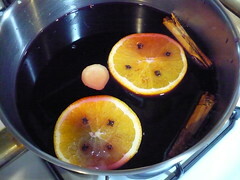 Variations on this theme of adding spice to booze have been popular for centuries in many European countries, and there are historical records of a number of old English recipes for mulled wine – some of which date back as far as the fourteenth century, although these recipes were almost certainly very old even then. These days we see that part of central London as being an area of very expensive real estate, but in the early 19th century it was almost exactly the opposite. Tottenham Court Road was then part of the notorious St Giles ‘rookery’, which was probably the worst of all the slums in London (Hogarth’s satirical and moralising print Gin Lane was set in 18th century St Giles). Put some fizz into your summer! I don’t often post recipes, but it’s now June, and that means the real beginning of summertime (we’re now only a couple of weeks away from the summer solstice and the longest day, believe it or not). And summertime means barbeques and picnics and parties and outdoor fun – assuming it doesn’t rain, of course, and that’s a big assumption to make about the British summertime! Of course, barbeques, picnics and parties – enjoyable though they are on their own – are not really complete without something fizzy and preferably alcoholic to get happily drunk on while sitting in the park or the back garden with your mates and your sunnies on. The popularity of Pimms as the essential summer drink in recent years is all very well (don’t get me wrong, I love the stuff), but here’s a few slightly different ideas for quick, easy and delicious summery sort-of-cocktails, most of which were inspired by friends and family. The 17th century was a strange time for Christmas. For the first few decades of the century, people celebrated just as they had for hundreds of years, until a political squabble between the king and parliament exploded into a prolonged period of civil war and the rise to power of some distinctly humourless politicians. This was a very foolish move, as midwinter celebrations of one form or another have been central to human culture and belief systems for thousands of years. However, Puritan religious beliefs trumped the near-universal need for people to have fun and celebrate during the darkest, coldest time of the year. 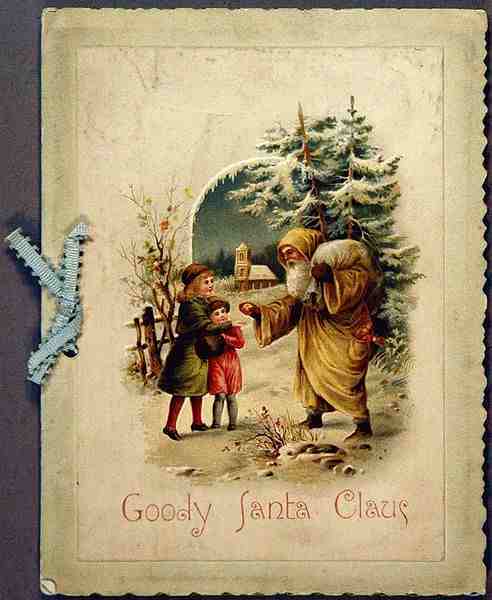 Today, when we think of a ‘traditional’ Christmas, it is a Victorian-style celebration we are envisioning. Christmas trees, crackers, pantomimes, cards – all these now-familiar seasonal things were either invented or popularised by the Victorians. There are, however, three people in particular who are now considered mostly responsible for the creation of what is today seen as a very British, very Victorian take on Christmas – although, strangely enough, only one of them was actually a Brit! The first of this trio was a member of the royal family. The introduction of the Christmas tree to Britain is traditionally thought to be down to Victoria’s German husband, Prince Albert. However, it is more likely that it was George III’s German wife, Queen Charlotte, who brought the first tree to Britain – Albert merely popularised them. In the early years of their marriage, Victoria encouraged German Christmas customs to make her husband feel more at home in Britain, and approving press coverage meant that it wasn’t long before the Christmas tree became wildly popular with the British people. The middle classes, in particular, were soon copying this royal idea in their own homes, decorating their trees with candles, small toys and gifts, cards, sweets and other goodies (like sugar plums – see below).